For water detection in gasoline and diesel fuel tanks. WATER FINDER SPECIAL changes colour from white-like to pink when it comes into contact with water present under fuel or mineral oils. Water can cause significant corrosion in storage tanks and other devices. It is therefore extremely important to regularly check for the presence of water. Apply the paste to the bottom of the dipstick and lower it to the bottom of the tank. Once the dipstick has been raised again, presence of water is instantly visible as the paste will have turned pink. 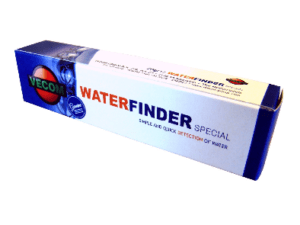 WATER FINDER SPECIAL is usually available in boxes containing 20 tubes of 70 gram.